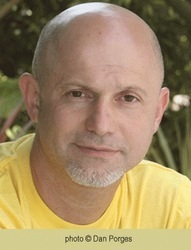 Born in 1963 in Kishinev in the former USSR, Boris Zaidman immigrated to Israel in 1975. He holds a BA in visual communication from Bezalel Academy of Art and Design, and also studied copywriting. Zaidman has worked for many years in advertising and marketing-communications, as a graphic designer, art director and copywriter. He also teaches communications at several academic institutions. Zaidman was awarded the ACUM Ashman Prize (2005) and the ADEI-WIZO Prize (Italy, 2009).